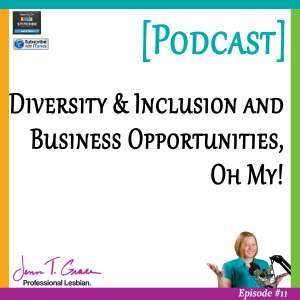 In this episode of the podcast we talk about the shift from diversity to inclusion. We discuss supplier diversity and the many opportunities it presents for your business. And we talk about multiple ‘wins of the week’ for both my business and several listeners of this podcast. Check out the sponsors of this podcast at the Human Performance Academy. 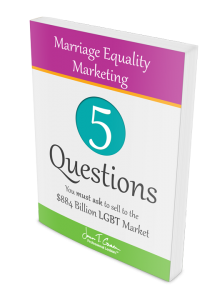 You are listening to the Gay Business and Marketing Made Easy Podcast, Episode Eleven. Hello and welcome to episode number eleven of the Gay Business and Marketing Made Easy Podcast. I am your host, Jenn T. Grace and as always I am super excited to be sharing this episode. And it is May, and spring has sprung and in a previous episode I mentioned that there could be chirping sounds in the background, and I am also going to put that out there today because there is a very large nest of baby birds about- looks about twelve feet or so from my desk, and they’re really loud today. So if you can hear them, just know that those are baby birds on my end and you’re not losing your mind on yours. So today’s episode I am going 100% unedited, yes unedited. And I don’t do a whole lot of editing on my episodes usually anyway, I usually try to clear up some of the long pauses or me looking up information that I should have had prepared in advance, and you know that kind of stuff. But today I am going completely rogue and I am not going to hit the pause button, so let’s see how this turns out. I was recently listening to another podcast, and the person who was the host of the podcast was saying that she was getting a lot of feedback from listeners who were saying that her podcast itself was a little bit too polished and I don’t necessarily think that mine has been all that polished, but I’m inspired by her completely going unplugged I believe is what she called it for her episode, so now I’m encouraged to do the same. And with that being said I just want to dive into what we’re going to talk about today. So I’m just going to give you a high level overview of what we will discuss, and then I will go into those into greater detail. So for people who are listening to this podcast for the very first time, this is a biweekly podcast. It alternates between expert interviews with some amazing business leaders who are in the LGBT and diversity space, and alternately on the opposite weeks it is me teaching you something about business etiquette or some sort of marketing tip or trick that will help you be successful in marketing to the LGBT community. So today’s episode is around education, and what I would like to do in a few minutes is address a listener question that I received and then also go into some details about the topic of supplier diversity and tier two opportunities for business owners listening to this. And you may have already just zoned out when I said supplier diversity and tier two, and my end goal around this is to be able to explain to you what supplier diversity is in a really digestible way so when you hear that term it doesn’t scare you. Twitter is embracing the workplace.. So that is definitely my end goal and we’re going to talk about that in a few minutes. But I really want to start off the episode with my win of the week. And this is how I start off all of my episodes, and this week I actually want to do it a little bit differently. I want to talk about a win that I’ve had personally in my business, but I also want to share some wins that I’ve heard from other people who are having success stories. And it’s really exciting to be part of a community and be creating a community of my own. And I hear from so many of you on any given day and it’s just so great to be hearing your successes; and I really just want to highlight some of those because it’s really friggin’ awesome to be really blunt. And so today my personal win, and it’s- you know a win of the week doesn’t have to be something that’s totally monumental, it really doesn’t. And today is one of those examples. I got a Tweet from someone who is really active and engaged with me on Twitter, and their Twitter is Embracing Workplace, and it’s @embracingwrk and they retweet a lot of my content and I’ve had some interactions back and forth a couple of times and I’m also so appreciative of someone who’s willing to retweet something or talk about a blog that I’ve written. And today they sent out a blog post of mine that I wrote for yesterday’s post- so yesterday being May 13, I believe. Yes. So yesterday was May 13th and they took the blog that I had written in regards to a fairly entertaining conversation I had with my mother on Mother’s Day. And they blasted it out to their Twitter followers. And all it says is, “Another great piece from one of my favorite bloggers. All it takes folks, is being respectful and friendly.” And I take this as such a win for two reasons. For one, just to be considered someone’s favorite blogger, I think that’s really exciting. It makes me feel like even if it’s only one person reading what I’m writing, somebody’s really enjoying that content and they’re really consuming it and they’re taking what I’m saying to heart and to me that’s just- it feels so great and so successful. So I’m so appreciative that they feel like I am one of their favorite bloggers; I absolutely love that, that’s just so great to hear. And then on the second piece of it is the phrase, ‘All it takes folks is being respectful and friendly.’ And to me, that is such a significant phrase that just really sums up what I’m trying to accomplish here. 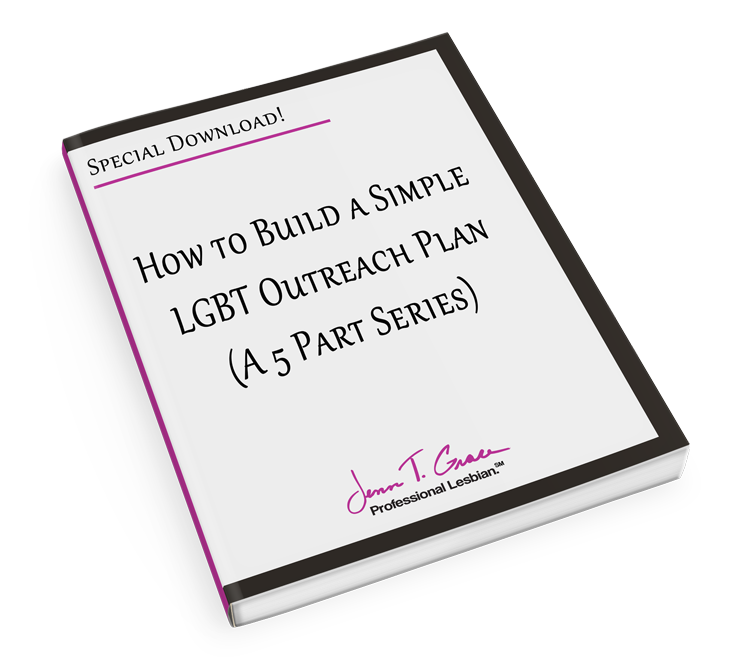 At the end of the day my end goal is to really help you communicate better with the LGBT community. And as I’ve said in past episodes and on past blog posts, that really most people are doing this out of good intentions and occasionally they make a misstep, or they say the wrong phrase or they do the wrong thing, and there’s no one there to really just kind of guide them and say, “Hey, I understand that you just said this, but I know you really meant that, but let’s talk about how you could reframe what your statement was so that way it’s really resonating with the LGBT community.” I really want to play the Devil’s Advocate and I just want to be able to see both sides of the story, bring both sides of that story to your attention and have you understand why something sounds the way it sounds or feels the way it feels. And knowing that this person just said, “All it takes folks is being respectful and friendly,” that’s really at the core of what I’m trying to do, is just really have respect for one another and understand that most people aren’t saying things that come across as discriminatory or negative or stereotypical because they want to; it’s just usually a lack of knowledge and a lack of education. So I’m really excited that that’s how my style of writing is being picked up and read by other people, so that’s really exciting and to me that merits a really strong win of the week for me. So I definitely wanted to share that. And I want to share another success story, and then I have another little bit of one which goes into a question that I’d like to answer. And this next success story is something that’s really close to me personally because this is from a friend of mine, and this friend is a FNP, which is a Family Nurse Practitioner. And I feel like that’s important to mention because she works in a doctor’s office and she is a family nurse practitioner for a lot of patients. And she was actually the inspiration for me starting my blog originally. So as most of you know I’ve been doing this particular work for at least the last six years or so. I started heavily specifically in the LGBT realm around 2006, 2007; so I’ve been doing this for awhile and over the years I’ve always been that go-to person, where people just come to me when they’re looking for information around the LGBT community and I’ve really made myself open and available for people. But this friend in particular had a lot of really specific questions and we would just be texting or emailing and she would say, “Hey, I have a patient and they’re trans but they’re under the age of 18 and their grandmother has a problem with it; what type of guidance can I give my patient?” And she had a lot of these types of questions and it was her who really was the inspiration for me to start my blog. I was really looking for a new direction to take in terms of my business and it started to dawn on me that, ‘Oh hey, I’m having this conversation with her again, and I literally just had a very similar conversation with so-and-so last week. So how can I essentially use those one-all conversations as an educational platform for anyone else who’s interested in hearing this.’ So this really started- so the blog itself started in November; so the blog is relatively new, we’re only going on six months or so. But I’ve seen some tremendous success and I think it’s because a lot of people are just relating with what I’m saying and they’re able to take it in at their leisure, and essentially do with it what they wish. So they are reading a blog and it’s addressing a concern of theirs, then they’re able to proactively implement some sort of solution or, if it’s just one of those things like, “Hmm, I’m just going to remember that for next time, so should this situation occur again now I know what the appropriate way to go about it is.” And with this particular friend I am so incredibly proud of her because she’s just such an open-minded person, a receptive person, someone who’s willing to be taught new things and she’s just incredible. And having these conversations with her, like I said inspired the blog but she’s been really taking to heart what I’ve been advising her. So it’s just simple things like understanding the healthcare needs of your LGBT patients. And she was just sharing with me a week ago or so, that she’s really becoming a name for herself in terms of LGBT patients. And to me, that could not be any more of a big win for me personally but also for her. Because now just by her merely being educated around specific needs and nuances of LGBT patient care, she’s getting more clients or more patients coming in the office doors that are specifically requesting her because somebody told them that they should see her. And to me that is absolutely amazing and I’m so incredibly proud of her and I just wish that there were more scenarios like this that were happening, and there very well may be. And if something like this is happening to you, where you’ve just kind of changed your focus and are just trying to immerse yourself and be educated to better serve the needs of LGBT clients, patients, customers, what have you – let me know because I really, I want to hear from you and I want to understand what’s working for you and what may not be working for you. So it’s just- it’s so exciting to have her tell me that success story. So again, today my personal wins of the week really are sharing the personal wins of other people that I’ve helped impact in some small way. So that’s just another one of those really exciting things for me. And the other one that I received, is somebody who I’ve been going back and forth with on giving them a little bit of marketing advice around making sure that they understand their target market. And this is something that I’ve talked about both on the podcast and in blog posts; and actually in my book I address target marketing as well. And essentially he found my podcast- so he was just paying attention to my blog, and then realized, ‘Oh hey she has a podcast,’ and he was so excited and engaged and listened to all of them in a matter of like two days which is really fun, I love when that happens and I’m sure you could see the progression from if you went back and listened to episode one to today’s episode, I feel like they’re very different and I’m attempting to hone in on my craft a little bit better in the sense of not talking so fast and articulating a little bit better, and overall making it a little more digestible for you. So he sent me an email and the email says, “Thank you so much for addressing our first noted business concern and offering such wonderful, easy and specific advice.” So yay, because I was really going for the easy and specific advice; I don’t want to make things sound far more complicated than they are and a lot of times that’s essentially what happens. So he then goes in to say, “I understand clearly now the need to differentiate the ads based on the various segments of our target market and will definitely follow that advice.” So it’s great to know that if you’re listening to this and you’re inspired by something that I’m saying, and you take it a step further and actually implement which is awesome; and again if you are doing something like that, please, please let me know. But his question is, “The next question for me will be around the web design itself as it relates to the LGBT community. We have struggled in our own mind between adding images, logos, and/or products aimed directly at the community.” And then in parentheses it says (Beefcake shots, rainbow flag graphic, gay only products of interest, et cetera). “To help attract a gay audience versus not being quite so forward so as not to scare off the straight audience. Being gay men ourselves we certainly want to appear gay friendly, but how far do you suggest we go down that road?” And this is something that I wanted to address because I’m noticing a shift, and I was actually in a meeting a little while ago before I started recording today, and it was with a financial advising client. And we were talking about the shift from diversity to the shift to inclusion. And as many of you might know, there are diversity and inclusion departments and their primary goals are really to create an environment of diversity. So, which of course diversity is good for a variety of reasons but it just- it creates a better atmosphere, an atmosphere that people want to be involved in, want to work in, higher morale, all kinds of great stuff. So diversity has really always been the focus, even though the department’s called Diversity and Inclusion, and let me just preface with this is my personal opinion. So I’m speaking on no one else’s behalf but my own, but this is just how I see a shift in the trending of how things are. And if we’re looking at diversity, oftentimes it’s very segmented; so it’s pulling the diverse crowds out. So it’s saying ‘we have initiatives around attracting and retaining African American talent. Or we have an initiative around the retention rates of our female workforce. So these are diverse populations within a larger company, but they’re almost being segmented in a way where you’re isolating the fact that ‘Oh, hey we have an African American need,’ or ‘Oh hey we have a female need or a program,’ or something targeted specifically towards them versus the inclusion aspect of everybody is in this together, we are talking about diversity as inclusive. So I actually used this phrase earlier today and I made myself laugh with it, but I have small kids so to me Sesame Street isn’t anything that’s that too far off in the distance from current memory. And what I was saying is it’s like what Sesame Street ‘One of these things is not like the other.’ Right? So you have four things and three of them are squares and one of them is a triangle. It’s very obvious that one of them is a triangle. So if you’re thinking of diversity it’s almost like, ‘Oh hey here are the squares and the diversity piece is, oh there’s a triangle.’ Versus the inclusion type of mindset where everybody is included. So we’re really talking about inclusivity. And to me, inclusion is really the way that marketing is trending now. And I may have addressed this on episode ten of the podcast where I was talking about the Amazon Kindle ad, and I won’t rehash out the ad I’ll actually include a link to the ad itself in today’s show notes, which you can find at JennTGrace.com/011 for episode number eleven. And inclusion in this setting, and specifically to this question, is they are struggling with how do they position themselves as gay friendly, but how do they not alienate their straight audience. And to me, using that inclusion mindset is really the way to go. So what I would say in terms of being really tactical and on the nitty gritty details of the minutia level, is get your imagery on your website to be inclusive. And what I mean by that is find some imagery that has straight couples with gay couples. So you want to have imagery that is showing inclusion that, ‘Oh hey, it’s not a big deal that we’re saying we’re gay friendly, it’s just part of who we are.’ And I can see, like thinking of a banner on a website or like a website heading, and you have a- maybe you have an elderly couple, maybe you have a young couple and maybe you have a minority couple in the middle that’s of some sort of ethnic diversity. So if I’m going to a website, regardless of what they’re selling and I see young, old and diversity in terms of race, then I’m going to have an immediate impression that this company has some sort of values around diversity, or that they’re just inclusive. And this very easily could be very much intended, so the person who put this imagery up is specifically trying to scream, ‘We are diverse, we serve a diverse population.’ But it also could be something that is just happening naturally because that’s just the nature of that business and who they are. So in this case, you are saying that you’re a gay male owned company, and you want to be able to target to fellow members of the community but you don’t want to really alienate or scare off anyone who’s not gay coming to your site. So what I would do is find imagery that shows gay couples interacting with straight couples. And I think from what I understand about your business that your business is specifically to men, not to women. So we’re really just talking about gay men in this instance. Or bisexual men or trans men. So I would say to find some sort of imagery where it’s just- it’s very matter of fact. You don’t want to make something seem like such a big deal, like ‘Oh we’re isolating, we’re marginalizing our audience because we’re throwing up rainbow flags and pictures of beefcake men and really screaming this is a gay only product.’ You don’t really want to do that because that’s just kind of isolating people versus saying, ‘Oh hey, we’re all part of one big audience, and your sexuality, your sexual orientation, your gender identity, your gender expression; none of that matters. At the end of the day, we’re speaking to you because you are a man and men are our clientele. It does not matter who you’re sleeping with or how you identify. At the end of the day, we want to talk with you and our product is superior, and it’s high quality and it’s amazing because you are our target demographic because you are a man. And you are a man of a certain age of a certain socio-economic background, of certain psychographics, all that stuff. But being gay doesn’t have to be part of that psychographic data.’ So we could say that your target market is men who are 25 to 35 who are single. You know at the end of the day it doesn’t matter, in this case- depending on what you’re selling, it’s all product based. So if you’re selling something that it’s irrelevant whether or not they’re gay, then don’t even worry about that particular aspect. Just worry about showing all different types of men. So it’s the same scenario if you were trying to appeal to a broad audience of men of different ages. So you’d want to have- maybe you have older men, maybe you have younger men, and maybe you have a gay male couple. And all of those images are somehow drawn together in the same heading of the website or in some sort of imagery on the website. Moral of the story.. be inclusive. So I don’t know if that has directly answered your question or if I’ve just made it sound incredibly complicated but the moral of the story is to just be matter of fact about what you’re doing, and be inclusive, and just have imagery that’s portraying those who you’re trying to target to. And don’t really create some sort of tab on your website that has a rainbow on it that people can click on and they get to the gay-specific stuff. At the end of the day that’s not what you’re trying to do, because you’re alienating your gay audience. And you know, you’re just trying to sell your product and it’s good for anyone regardless of sexual orientation. So I really, really appreciate those who are already doing that, so thank you so much for that. So I want to talk about a couple of other things quickly and then get into the second piece of things I really wanted to talk about which is around supplier diversity and tier two opportunities. And before I get into that, I want to send out a special plug for two dear friends of mine. And I recently launched my book as I feel like most of you know, and if this is the first time you’re listening to this podcast, the book came out in the middle of April. And when I was doing the book I realized, ‘Oh shoot, I need to upgrade- I need to update my headshots.’ So I contacted a local LGBG Chamber of Commerce member and for those listening to this and have been loyal listeners, you are very familiar with what an LGBT Chamber of Commerce is at this point. But if you’re not, head on over to my website at JennTGrace.com and do a quick search for LGBT Chamber and a blog post will come up that will explain to you all the really awesome, amazing benefits around belonging to an LGBT Chamber. More on my amazing photoshoot.. So, anyway. So today I want to share with you what an amazing time I had actually doing a photoshoot and having new photos taken. If you take a look at any of my stuff right now, I have a new picture on Twitter, I have a new one on LinkedIn, I have a new one on my website, my podcast artwork now has a new picture, and then of course the most important thing that I was trying to accomplish was getting a picture to include in my book. So spending a day taking pictures is a little bit emotionally exhausting but I do want to just send out a special thank you to Cynthia Lang of Cynthia Lang Photography, who was amazing and very unsuspectingly hilarious. So I’m always drawn to people who can make me laugh, who are funny and entertaining and she certainly fit the bill for this and she was just incredible and if you haven’t seen my new pictures yet I encourage you to check them out because I’m so proud of them and that’s so rare that I can say that because normally I see pictures and I cringe. So I’m super happy with that and I just wanted to give Cindy a special shoutout. Then I also want to give my friend Jen a special shoutout as well, because she was the one who had to put up with me all day helping me change my outfit 55 times, and keep my hair and makeup in check. So thank you Jen so much for putting in the effort of trying to make me look presentable all day and between the two of them I feel like I really got some awesome pictures out of the deal. So I wanted to bring that up, and I wanted to share with you that I am in the process of recording the audio version of the book. So if you’ve already downloaded the eBook version I thank you so much for that, and if you are waiting for the audio book version which I know some of you are which is pretty exciting. That is almost done; I’m hoping to have that available- we’ll see, but I’m hoping that by June 1st that will be available. And here’s my book.. for a discount! But the reason I bring up the book is that I want to provide you with a discount for being a loyal listener. I just- I genuinely appreciate you taking the time out of your busy day, whether you’re on a treadmill right now, or driving in your car, or sitting at your desk at your office. I really appreciate that you are listening to this, and I want to provide you with a discount on my book if you choose to purchase it at any point. And you can head over to the website and on the right hand side it says ‘Get a Copy Today,’ or something to that effect.  And if you click on the picture and once you’re in the shopping cart, if you type in gbmpodcast all in lowercase – for Gay Business and Marketing Podcast – you will receive a 20% off discount. So that’s just a very small token of my thank you and I really do appreciate you. So let’s just keep on doing what we’re doing and seeing success on both my end and yours; because it’s really exciting and really rewarding to see. So now I want to talk about supplier diversity and tier two opportunities for certification. And the reason I bring this up today is that I was recently on a panel in Boston, and I got the great pleasure of sitting next to some really incredible people. And the panel was all about supplier diversity and opportunities that LGBT business owners, women business owners, African American business owners, people with disabilities who own a business; all these different types of disenfranchised groups for lack of a better word. And I got a chance to sit with all these people from these great organizations who are all trying to do the same thing, which essentially getting business owners who are notoriously under represented, opportunities. And supplier diversity is just- it’s a really behemoth of a term that’s really complex and really scary to people. So my job here today is to make it sound simple and not scary. 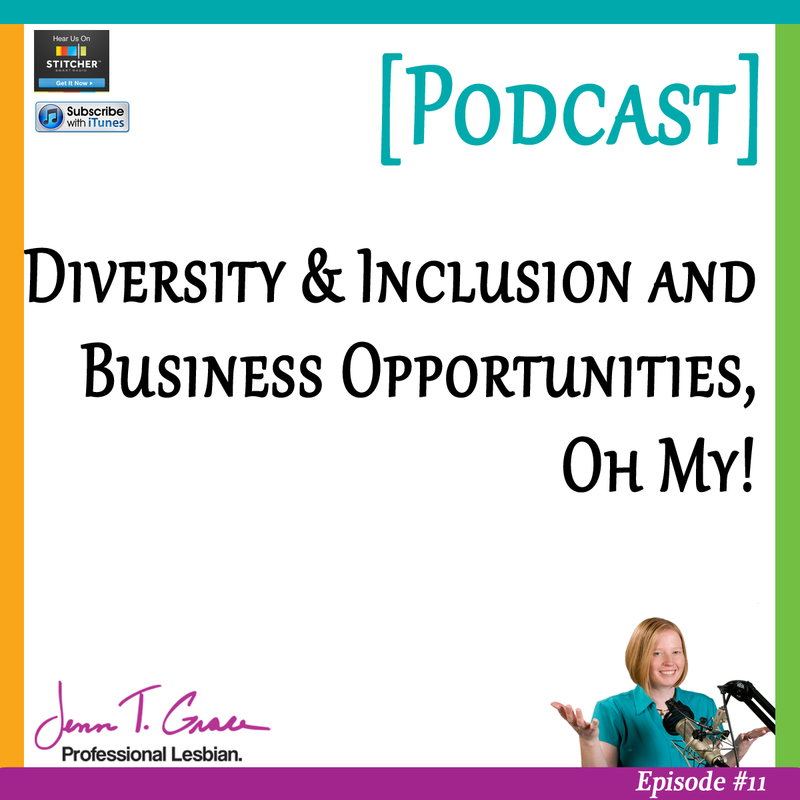 Because you hear supplier diversity and I did a podcast, I believe it’s episode number- so I did a podcast a couple of months ago that’s actually episode number eight. And it’s with Heath Cox who owns a company called Certify My Company. And she and I got to dig in some pretty good detail around supplier diversity and what it is and what types of opportunities exist. But today I just- I want to try to break it down even further. Because supplier diversity just has like a scary sound to it, and honestly it doesn’t have to be. So if you’re listening to this and you are a business owner, and you are a women, maybe you’re African American, maybe you’re Asian American, maybe you have a disability, maybe you are a veteran, or maybe you’re an LGBT. You could fall into any category of diversity. And supplier diversity is really when- so I’ll just use my company as an example. So we have my company, Gay Business and Marketing, and let’s use a company that I was actually on the panel with- we’ll say TD Bank, and I’m not doing business with TD Bank right now but I’m just going to use them as an example because they’re a really awesome company and they’re really strong in what they’re doing for LGBT people. So I may go to a networking event and someone might say, “Oh hey Jenn, you should go talk to so-and-so, she’s the supplier diversity manager for TD Bank.” And now me as a person unfamiliar with what supplier diversity is, having someone say, “Oh hey go talk to the supplier diversity manager,” may seem completely foreign because it’s like why would I want to go talk to this person, I don’t even know what supplier diversity is. So essentially, what supplier diversity is, is that her role is to find suppliers to fulfill the needs of the company. So TD Bank may have marketing needs, they may have furniture needs, they may have office supply needs, they may have some sort of cleaning services needs. They could have a variety of different needs at that particular moment, and the job of the supplier diversity manager is really to be the liason between internally within the company to find out what the needs are of the company, and to find vendors and suppliers who can fulfill those needs; and with a focus on diversity. So the company may have a need for a cleaning crew or a landscaping crew or a marketing company. And the supplier diversity manager is going to look for a cleaning crew, a landscaping company or a marketing company that have some sort of diverse criteria. So are they certified as LGBT owned? Are they certified as a woman-owned business? So they’re looking for those specific vendors. So if you are any one of those above, you want to find ways that you can leverage those opportunities. So I hope I’ve explained it to this point that you’re following me. So essentially a supplier diversity manager is a match-maker between a diverse owned business and the corporation for which they work for; and they just want to match-make opportunities. So you may be listening to this and thinking, ‘My company doesn’t have the bandwidth or the capacity to sell to someone like TD Bank.’ And you may be right. So here’s where the real opportunity is going to lie; and this is what I’m going to try to explain with just words, without a visual, but try to follow me here. So if you’re looking at this tier one opportunity and- okay so now I’ve already confused you because now I’m throwing in tier one and you don’t know what I mean. So we’ll use my company as an example again. So my company, Gay Business and Marketing is doing business with TD Bank; and again, that’s not true I’m just using this as a hypothetical. So we’re saying that they’ve engaged with me as a vendor, as a diverse supplier to their marketing efforts, their marketing department. So now as my company, the contract likely between myself and TD Bank is going to be something at least in the six figures, if not, possibly more. So if we’re talking about it in the sense of ‘this is a huge contract,’ right? So this is what a tier one opportunity is. It’s when you have your business that’s directly tied to doing business with a large company and it’s a really large contract; so that’s a tier one opportunity. But then there’s what’s called a tier two opportunity, which is really all of the vendors that I’m now engaging with to fulfill that contract for TD Bank. So I may be a home-based business to start and I realize, if I’m going to handle this six or seven figure contract with TD Bank, then I’m going to have to hire some more people. And if I’m going to have to hire some more people, I’m going to have to have places for them to work. So I’m hiring more people, so now maybe I’m using some sort of staffing or recruiting firm to help me hire those people. And now I need to find an office space because I have to find a place to these people. So now I need to find a realtor so I can house these people. Then I realize, ‘Oh now I have an office but I have no furniture in it. I have no office supplies in it. I have no technology related equipment in it.’ So me as being that tier one supplier to TD Bank, I have now engaged with six or seven other companies that are now working for me on behalf of this contract to fulfill for TD Bank. So they’re all tier two opportunities. So really it’s them doing business with me on a tier two level. But then we can actually take it even a step further. So I may be looking for office space that’s of some inordinate, giant, ridiculous amount of space and it takes more than one realtor to help find it. So that realtor, that’s my tier two, has now had to subcontract out and get another realtor involved; so maybe now that’s a tier three opportunity. And maybe for all of the office furniture that I am looking for, maybe I’m really particular. Maybe I’m really specific on what I want and now that specific office furniture supplier now has to seek out another business to help fulfill my needs. So now that’s another tier three. And if you have a visual, it’s almost like a giant spiderweb where you have that really big pool of money at the top. And it’s just that big, giant six or seven figure dollar contract. At the end of the day most businesses could not handle that size contract. But I guarantee, you sitting here listening to this thinking about your business and how it might flow into this, you could easily handle my referred business. So if I’m sending down work to you as a tier two supplier, that’s easy. That’s not necessarily easy in that sense, but that’s an easy opportunity for you to take advantage of because that’s right in your wheelhouse in what you do. So if I get a contract with TD Bank and now I have to relook at how some of my own policies or legal documents are set up. So if you’re an attorney listening to this, it would be very easy for me to come to you and say, “Hey, I just had this take place and I have to revise my buy/sell agreement. Can you do this for me?” Of course you could totally do that. So doing that is much easier to comprehend versus doing some really, really large project and large work that requires a large staff and a lot of resources to be working direct to TD Bank. So just imagine it as a giant spiderweb, and understanding that the tier one opportunity is really just one piece of this really large puzzle because when one business gets this tier one contract, essentially everyone wins. So if I get a large contract with TD Bank that happens to be six or seven figures, that’s going to impact my community locally significantly, because I’m going to have a lot of needs, I’m going to have a lot of things that need to happen to change expansion, I’m going to be contributing to the community a lot more, I’ll be paying more taxes. So it’s one of those scenarios where everyone wins and this is the beauty of supplier diversity is that there’s programs out there that are set up with the specific intention of helping businesses be match-made with other businesses or corporations. And I personally find the absolute best bang for my buck, from working with other certified businesses. So I don’t work with a lot of corporations, I work with a lot of fellow certified businesses. So for example, I have a client that I’m working with right now who is a financial services client and she needed a very specific style of writing that could be approved through compliance and you know, jumping through a gazillion hoops because that’s just the nature of the financial services industry. And she needed some really good content and I consider myself to be a writer but I write in a very specific way. And writing the way that she needed this written is not in my wheelhouse. So what I did is called Bonnie Osborne who is a writer in Sacramento, California, who is a fellow woman-owned business and LGBT-owned business. So because of my relationships with the LGBT organizations and the women-owned business organizations, I’m able to know that that’s exactly her specific niche. So why not take advantage of that- and it doesn’t matter if I’m located in Hartford, Connecticut and she’s in Sacramento, California; at the end of the day what’s best for my client is getting the top resource to do the job that needs to be done. So it was really- it’s really amazing to have access to each other, and be able to work together. And if it weren’t for being a certified business, I would never know that Bonnie had this great resource over in California. Again if you’re listening to this and it’s sounding a little bit hazy and foggy, please reach out to me because if I’m saying and I’ve got you to a certain point and all of a sudden you just- I’ve lost you, I want to know how I can reframe that so I’m not losing you. So I would love for you to reach out to me and let me know if this makes sense to you. And this is something that I do go into a little bit of detail in my book, it’s the last section of my book in resources where I talk a little bit about supplier diversity and these opportunities to be had. And at the end of the day I truly believe that these business to business opportunities between each other are so incredibly important and there’s so much value to them that I really want you to understand the options available to you so that way you can start taking advantage of it. Because there really are tons of opportunities out there. So let’s see how many times I can say opportunities in one sentence. Anyway, so yeah. So I am really excited about all this stuff and supplier diversity is something that I’m always trying to bring down to a base level and I may dedicate an entire podcast at some point to just talking about tier two opportunities that exist, or supplier diversity as a whole I should say. And so if you’re interested in hearing more about supplier diversity and find out how you can leverage your minority status, whatever that may look like, please let me know because I’m happy to send an introductory email to the appropriate resource and guide you in the right direction of additional resources to really capitalize and leverage on it. So now let’s switch gears for a moment and before I share with you a couple of extra things and then we’ll say goodbye today, I do want to provide you with a word from my sponsors at the Human Performance Academy. Okay, thank you to Michael as always for those encouraging words. The Human Performance Academy really is pretty awesome, and I say this every month, and not just because they’re a sponsor but because I really believe in what they’re doing. So if you are interested in finding out more information about them, there is a resources tab on my website which will direct you to their website. So definitely check that out. A couple announcements before departing..
And I just want to share a couple of announcements and then we will say goodbye. 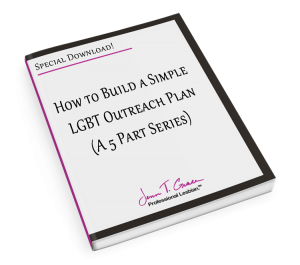 So the first of these announcements is the date of my next webinar is on June 7th from 1:00 to 2:00 PM Eastern Standard Time, and this is my ongoing monthly webinar that really teaches you about how to do business with and market to the LGBT community. It’s essentially what I’m always talking about on my podcast, it’s what I’m always talking about in my blogs; but it’s a chance for you to have one hour with me that’s live and you can ask any questions you have, whether I’ve addressed them in the webinar or not. So it’s really exciting for me and I love doing it and I always have such a great group of people who are really interested in hearing what I’m talking about. So that’s really fun and I’m really thrilled to be doing it again on June 7th. So if you are interested in finding out more information about the webinar, or if you want to RSVP, you can head over to JennTGrace.com/webinars. So as I mentioned before, there is a blog post that goes with this episode that you can find all of the links that I have mentioned on air, and that’s at JennTGrace.com/011 and that’s for episode number eleven. So the last thing that I want to mention is the introduction to the 30 Days, 30 Voices: Stories from America’s LGBT Business Leaders Podcast. I have been pumping this up and amping this up for a couple of months now since I think it may have been February when I had that first epiphany of, “Oh wow, I need to do something for Pride Month.” And I’m so excited that it’s actually almost here; it has been a labor of love and that is an understatement with the amount of work and effort that has gone into this, but I have had the most incredible time doing it, and I have spoken to the most incredible business owners and leaders and allies, and every type of person from the LGBT community and they have so many amazing things to say so for the month of June, my schedule is going to look a little bit different than it usually does. And I will not be posting any new blog posts around business or communications or marketing. All of every single day in June will have a blog post that will have a link to an audio interview from some business leader or someone from this particular project. So you’ll see that and then you’ll also notice that there will not be any educational podcast in the month of June as well, since there will be thirty interviews in June. I’m sure for those of you real eager to listen to them every single day, that’s going to be awesome. And then for some of you it’s going to be playing a good amount of catch-up because there’s thirty interviews and I usually only do two a month; so thirty versus two is quite significant. But I promise you that you are going to absolutely love the content in these interviews; it’s fantastic. There are some that are really funny and lighthearted, there are some that are just packed with solid good information around really making your business succeed. So I’m really looking forward to introducing that to you on June 1st. There is episode number twelve between now and then, which will be on May 29th and in that episode I’m going to focus specifically around just a really high-level highlight of this particular project. So I will announce those who are part of the project, I will maybe show a couple of snippets of information from people, maybe a couple of outtakes, some bloopers; I don’t really know yet. But my plan is to definitely get you excited and engaged about what’s to come in June because I’m really excited about it. So if you want to see more information on that you could head over to the website at JennTGrace.com/30days30voices and that’s 30days, 30voices; no spaces, hyphens or anything like that. So as always thank you so much for listening to this episode. If you’ve enjoyed what you heard I encourage you to leave me a review in iTunes or share this episode with a friend or colleague that you think could benefit from this information. So if you’re looking to reach out to me by any means, head on over to my website and you can find all of my contact information there. As I stated in the middle of the episode, if you want to reach out to me because you have a specific question, please do. I have an open door policy and I would love to hear from you. Thank you so much and I will talk to you on the 29th. The next webinar will be on Friday, June 7th from 1PM-2PM EST. 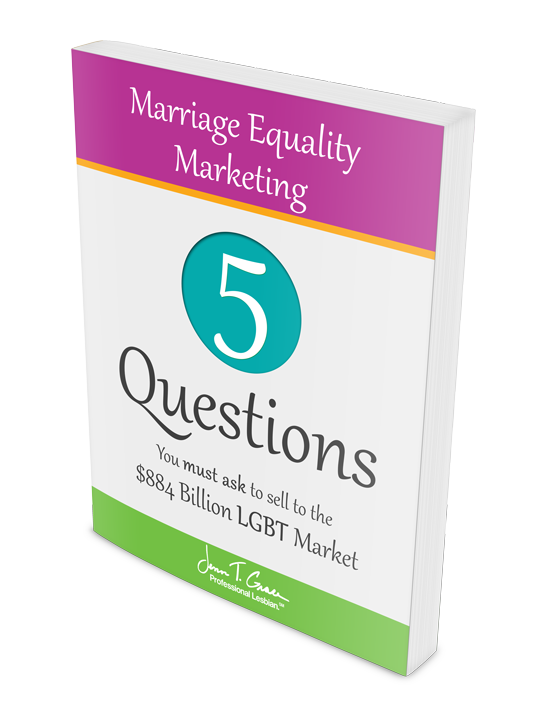 I will be hosting a webinar that will teach you about how to do business with and market to the LGBT community. The best part about this is that we’ll be doing a live Q&A at the end of the webinar so it’s your chance to ask me questions you may have. You can RSVP here. Leave me a review in iTunes! ← What’s the buzz about the ‘gay dollar’? … and why you should care.